It finally happened! My get rich at a moderate pace plan is beginning to come to fruition! After nearly nine years and over five hundred different posts, Google has emailed me to tell me that they have cut me a cheque for $100 (Canadian, in case it matters - or almost $77 US). Not sure what to do with this newfound windfall - maybe invest in cryptocurrency?! Stay tuned for when I can report on my $200 threshold... In 2027 if we can hold the course! Water Running in the Bathroom! 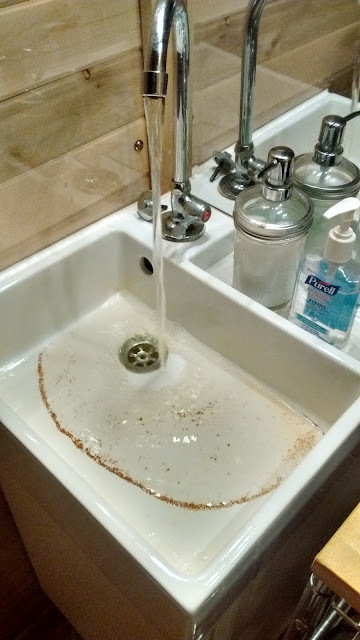 After a couple of mild days, and warm fires, and wishful thinking, the water line in the bathroom suddenly burst to action just the other day! 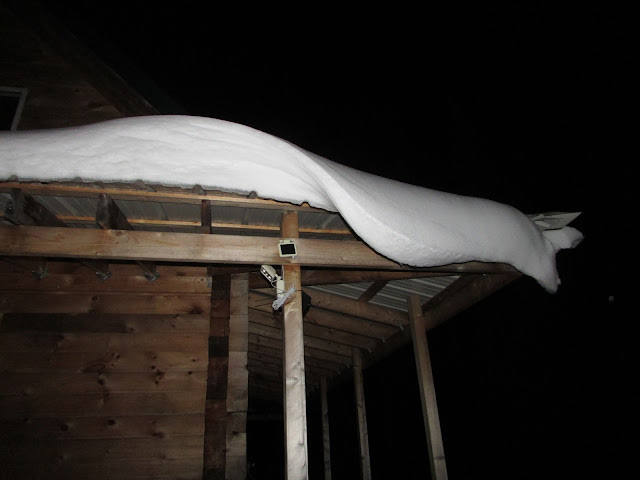 We received some warm temperatures the other day that let the snow start to slide off the porch roof. Here's one unusual structure that developed. 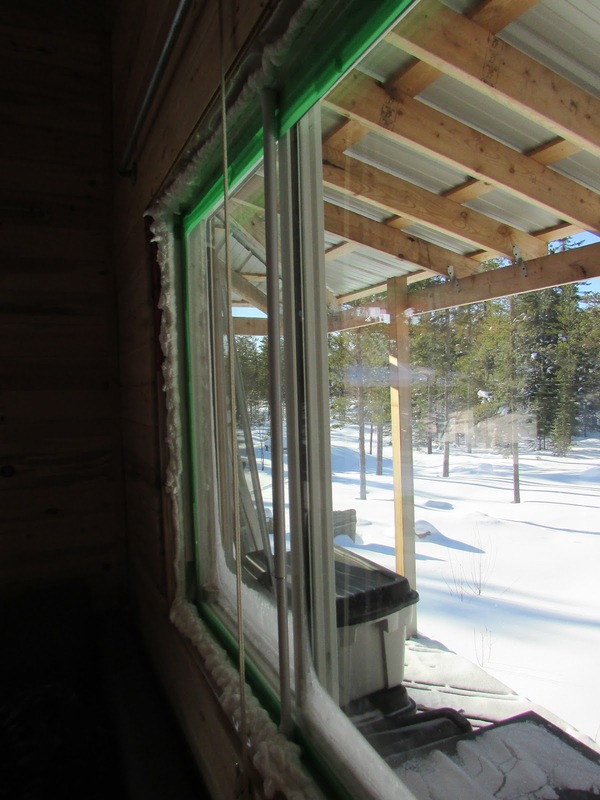 When I first conceived of my storm windows, it was without question that they would be mounted on the inside of the existing windows. The past two years that I've done this, I noted how the acrylic (or in some cases, thin poly plastic) was always billowing inwards. I assumed this was because the woodstove was pulling outside air in to heat and send up the stovepipe. This problem pane constantly pulls away from the frame, luckily the clothes dryer rope holds it in place. A handful of times so far this year, I've caught a whiff of woodsmoke and it really, really, REALLY upsets me to have that in the cabin. I mostly feel it has been on cold days with a wind that must just hit things the right way while the fire is running low. Twice though it's been suggested that another possibility is that there is an alternate chimney effect in the cabin due to air leaking out upstairs and coming in on the main floor. 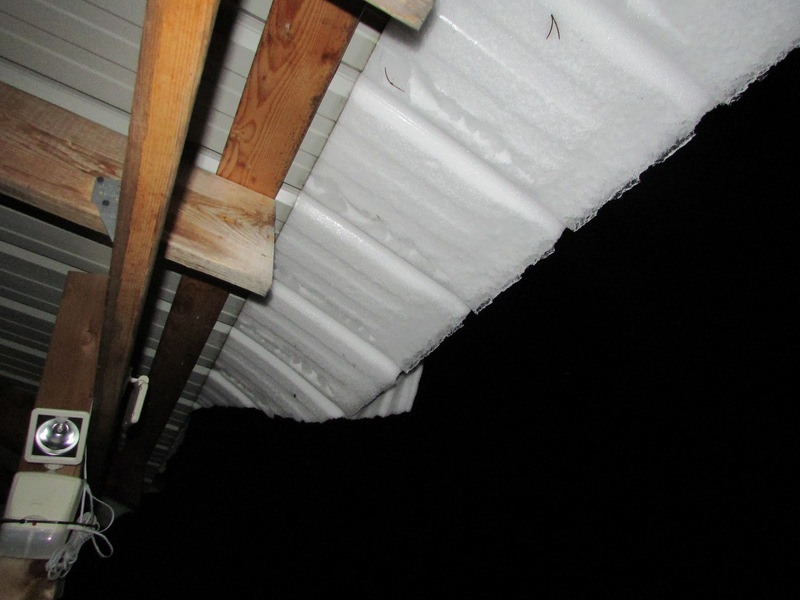 I was pretty sure not much was escaping through the attic, as it was spray foamed for the most part, and when I examine it from outside, I can see no places where snow is melting faster than any other locations. 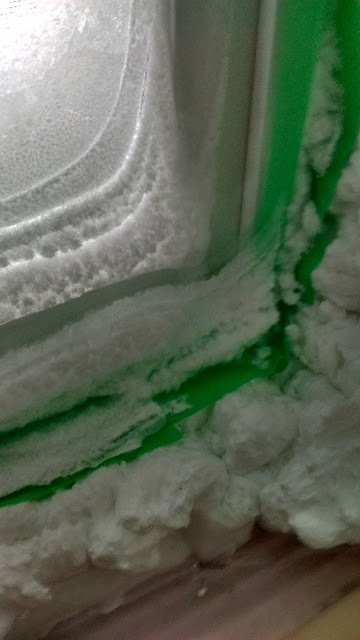 I hadn't (and don't intend to) install an acrylic storm on Kenny's bedroom window. 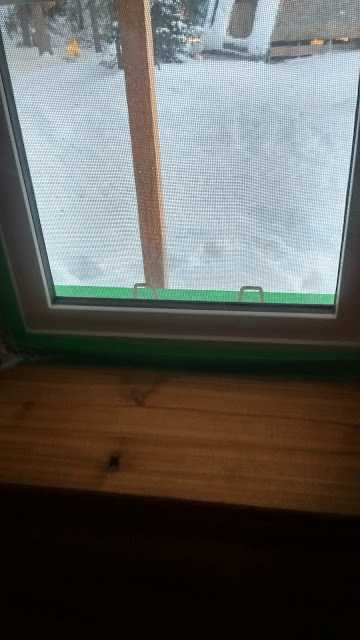 In case of an emergency, I didn't want him to have to try to quickly remove a hard, large sheet of plastic before opening his window and exiting out onto the porch roof. 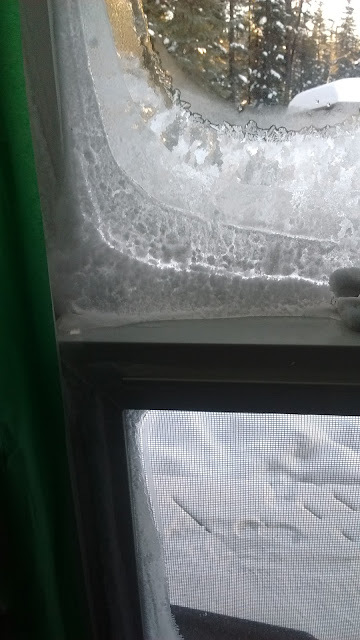 So far this winter, I hadn't done anything with his window. 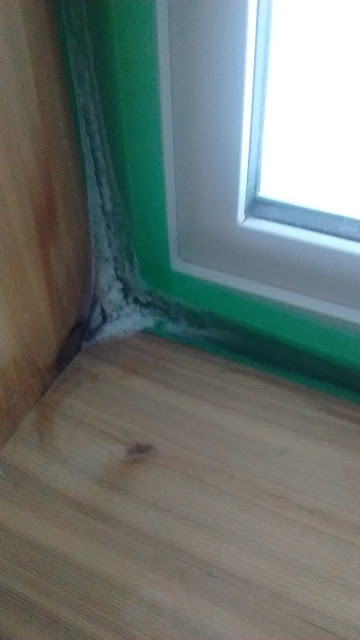 Finally I put on some thin poly that would be easily torn, and was immediately struck by how it was pushed OUT - against the window itself! Here was a clear chimney effect going on in the cabin. I wonder how much air has been escaping from his room all this year? It's hard to see, but the poly is being pressed against the glass here. In any case, this put me in mind of our front door - due to design restrictions, I had had to put the acrylic on the outside. Sure enough, it was being sucked in towards the cabin too. I remembered that I had an extra piece of acrylic sized to the pantry and bathroom, so I braved the extreme cold and taped it up outside the bathroom, which made an immediate difference to the amount of frost that was building up inside that window. I think it doesn't look half bad! Still a bit of frost in the corners at thirty below. 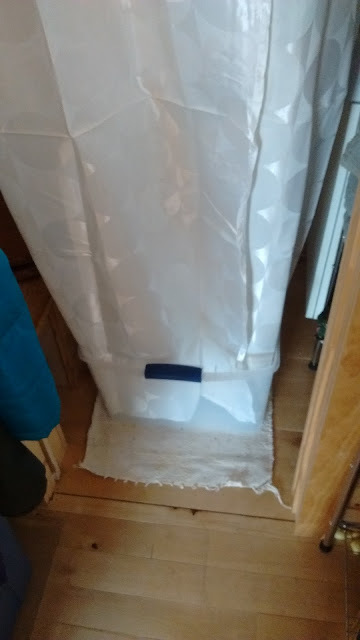 The worst spot for frost remains the pantry, but I'm tempted to remove the interior bathroom storm, move it to the OUTSIDE of the pantry and then see how things work. The pantry gets frost between the storm and the glass - mustn't be a very good seal. And loads more frost on the mounting tape itself too! One ongoing problem I've been having this year is the constant negative pressure on the main floor is causing the storm windows to pull away from the window frames and this dramatically reduces their effectiveness. I think putting the storms on the outside would help greatly with this issue, as the positive pressure there would actually serve to press the acrylic against the frames, instead of away from them. Next fall I think I will see how challenging it would be to mount them outdoors. 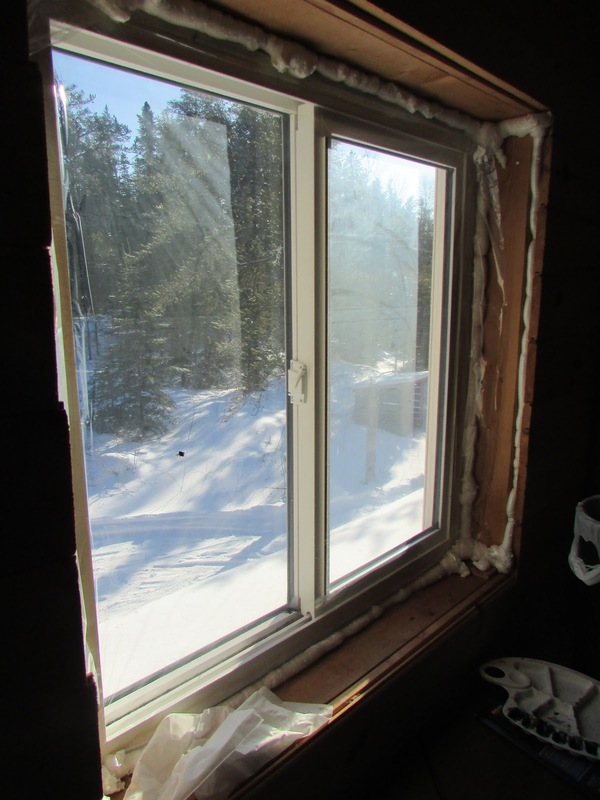 Even if they did tend to haze or discolour over the course of a few years, I'd accept that issue to have a warmer, less frosty cabin. 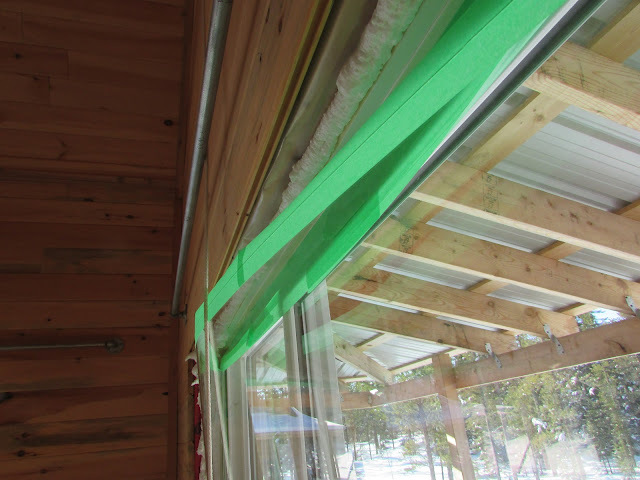 Aesthetically, it would also mean the lime green painters tape I use to mount the storms would be outside the cabin, and not visible to the occupants. As for the large window constantly pulling away from the frame? 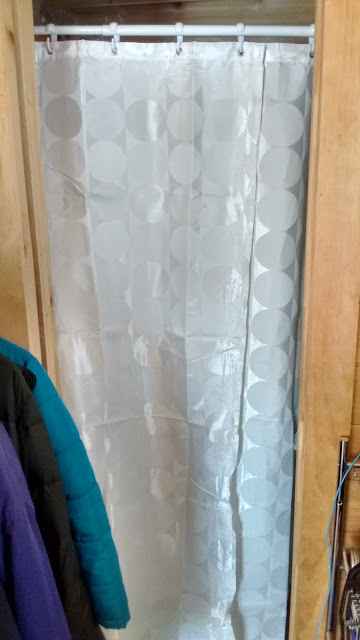 After using them to help create the portable indoor shower, I realized that spring loaded shower curtain rods could have multiple uses around the home or homestead, and in this case, installing one in the frame to run vertically and hold the acrylic in place was just the ticket. Even leading Donna to the window and telling her I had "fixed" that problem failed to get her to immediately notice it - the two whites blended in so well. 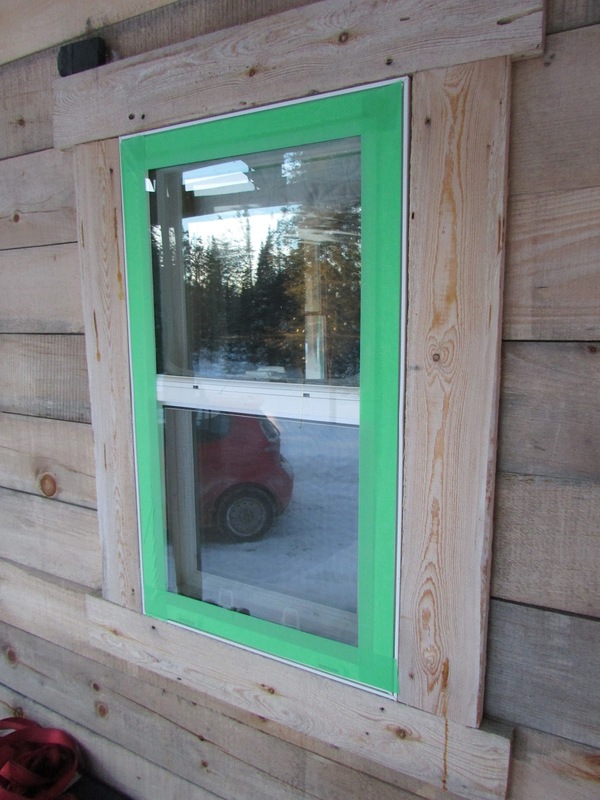 My solution to the "problem" window? 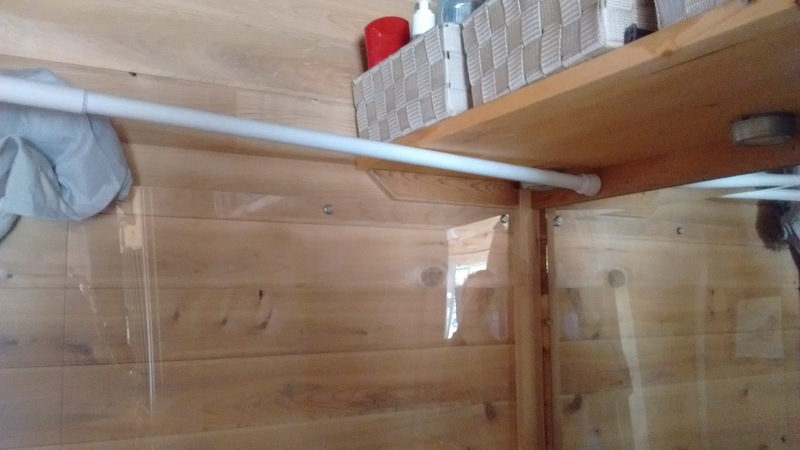 A spring loaded shower curtain rod in the middle of the window! 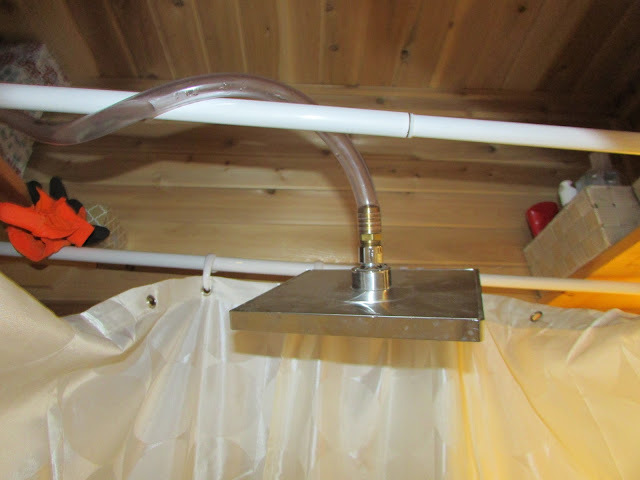 The other night we reassembled the portable shower. 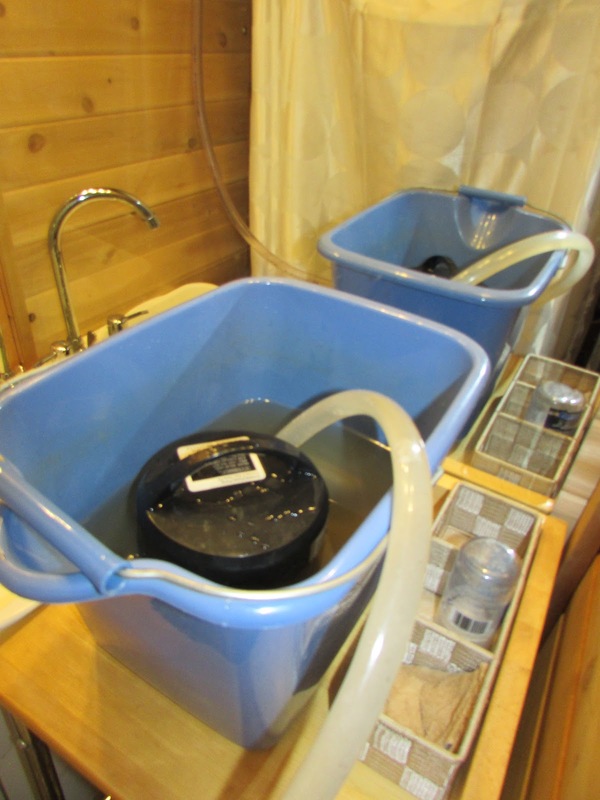 This time I put Panasonic Alkaline batteries into the sump pump and it made a huge difference compared to Walmart "Great Value" brand batteries, and an even greater one compared to Dollarama Zinc Carbide batteries. We were actually able to pump water a couple feet higher than the reservoir. Previously, we just poured water onto ourselves with pitchers because the pump couldn't supply any water to the showerhead. I put a pail on the stand beside the sink, and poured some nice warm water over the pump. I had to crouch, which was a bit uncomfortable, so I'd look into mounting the shower head higher. I also wish I was able to shut off the flow of water from inside - I think a pull chain type arrangement would be perfect. This came out to be a little low, but serviceable. Saturday was a clear, cold day, but they were predicting snow for overnight (which did come, although not too much). 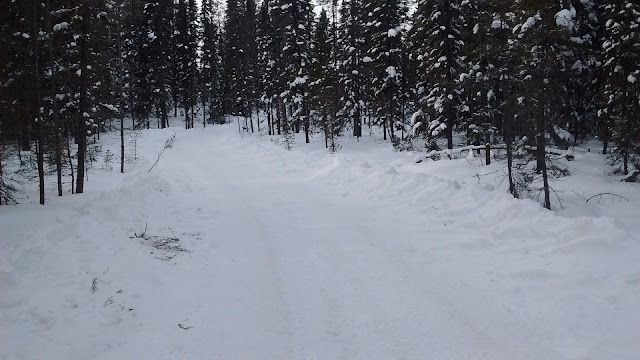 I decided it would be better to try to get the ATV started sooner, rather than later, so I thought I'd do a quick pass on the driveway just for practise and to warm up/charge up the battery. It took a long time to get it to finally start up, but it eventually did. I did my quick pass, and then noticed that the bank pushed back with much less resistance than I expected. I suppose that because our snow never went through any thaw/freeze cycles it was still fluffy all the way down. Emboldened by this information, I spent the next hour or two going back and forth along both sides of the driveway pushing the banks back until I could feel the front of the ATV going off the driveway. For once, I didn't get stuck! Now with the banks back nice and far, I can relax a bit and feel like I have a buffer before I need to call in anyone with a plough truck to actually move something heavy. I never expected to get this far, so I never took the obligatory "before" picture. It was about half this width. 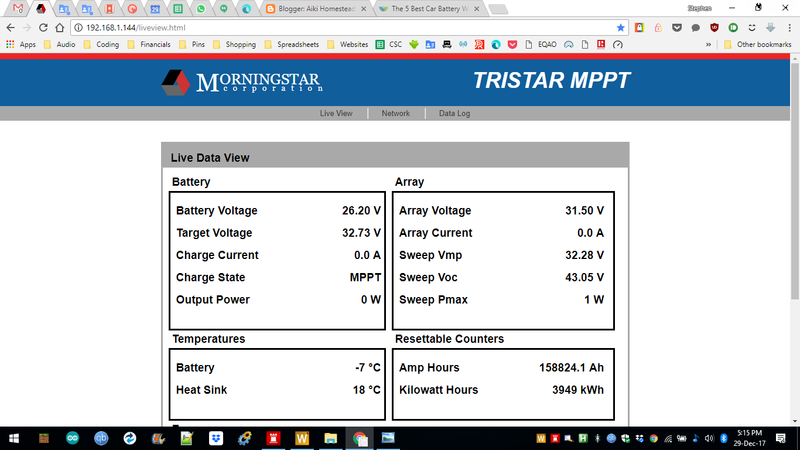 While it's been hard to quantify how much the heating pads on the solar batteries have helped, I can say that in spite of frigid temperatures, we haven't lost power due to overvoltage, and the batteries have been ranging between 6 and 10 degrees in spread between their temperature and ambient. Twice since the installation of the battery warmers, we've left the homestead and had to shut them off in spite of a surplus of power because we couldn't or wouldn't be sure to return home in time to turn the warmers off before the sun set. Enter another brainwave - a timer! 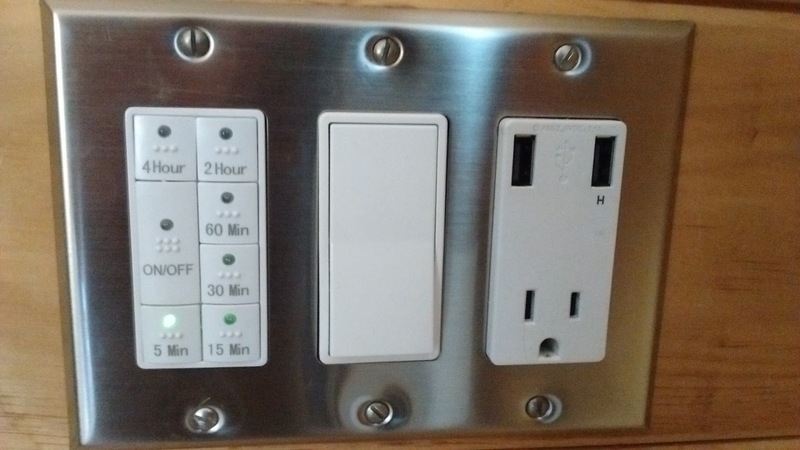 I've often wanted to have the sauna on a timer, as we regularly end up leaving the power on out there after we take steam, and while the draw is tiny, I am prone to obsess over tiny things. I couldn't find one that had longer than an hour on the clock locally, so I did what everyone does nowadays - off to Amazon! I found a lovely one that ranges between five minutes and four hours. Pretty much perfect for my use case! Multi flavoured panel n'est-ce pas? I installed it in about ten minutes, and it worked great right away! Another win? Sunday morning was the morning where the cold snap finally broke. The Cold Snap Finally Ends! Thanks goodness! 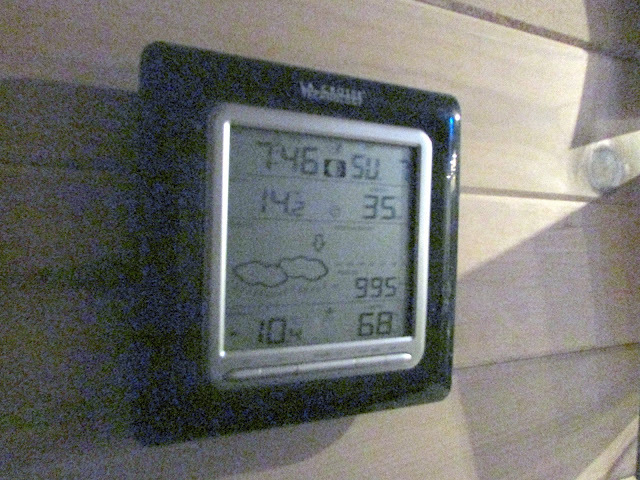 The cabin felt positively cozy this morning when I woke up to 14 degrees inside, and only ten below outside! Sorry for the potato quality, it was dark and I had to brighten the photo to show the numbers. We've had an extended cold spell here that has kept our temperatures close to thirty below for the past week and a half, and it isn't suppose to let up until closer to Sunday. 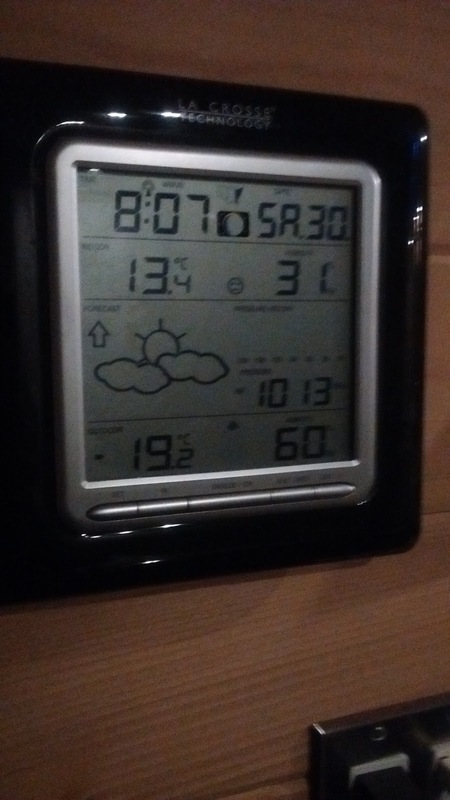 At twenty below, the sauna is very hard to warm up. Below that, it's nearly impossible. As such, the last time my pong began to offend even myself, I suggested that we could all just go into our respective corners of the cabin and wash up using water that we keep heated on the stovetop. It worked, but wasn't THAT fun. That's when I decided to try to create our own shower in the cabin. I was thinking of something private that could be assembled in the main room, but then realized that the bathroom, tiny though it may be, still offered an opportunity to experiment. First up, after my dentist appointment (Dr. Blazino - who is FANTASTIC! 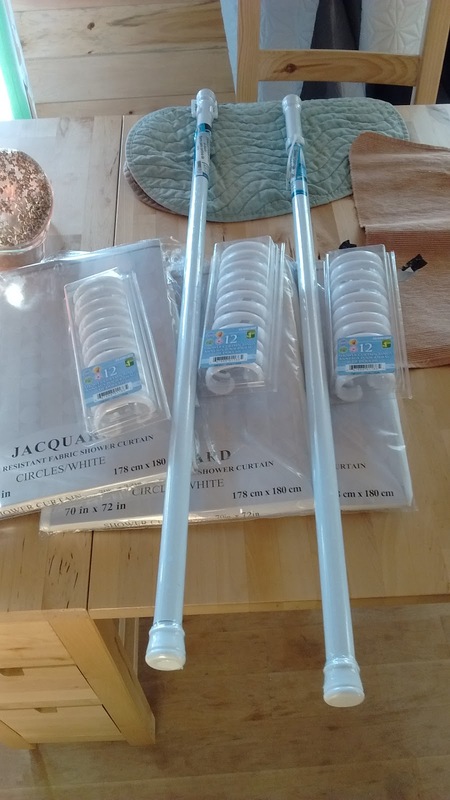 ), we hit up Dollarama for shower curtains, rings and rods. 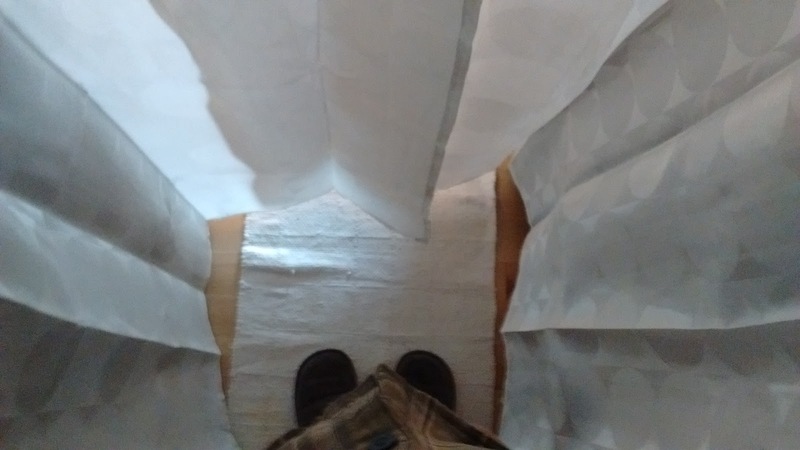 I was a bit miffed that the unpriced shower curtains turned out to be $4 each - I had somewhat expected that unpriced merchandise at Dollarama was a dollar by default. At least they were fabric, so they could be washed between uses. Then over to Walmart to buy a large tub that approximated the floorspace of the bathroom. I knew I had about 24" by 32". I tried to pick one with as flat a base as possible to make it easy to stand in. High sides were a mixed blessing - hard to step into, but they kept the curtain contained. Putting up the rods in the bathroom, I was a bit annoyed with how low they had to be from the ceiling to fit under my shelves. In the long term, I think I will do something different, but they were certainly sufficient as an experiment. Had to put the rod beneath my shelf. And over to the other shelf. Who didn't install these shelves at the same height?! It was a simple matter to put up some rings, and then curtains (overlapping) all the way around. The view that greeted Donna when she came home. Stepping into the enclosure was much, much nicer than I anticipated. 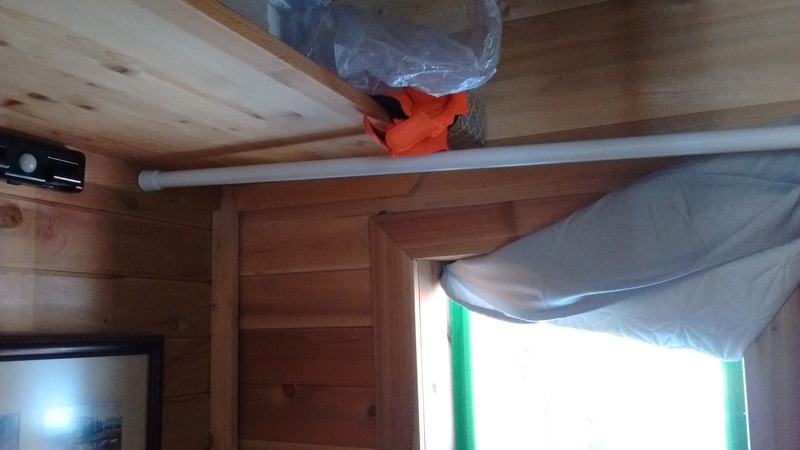 It felt like a shower stall, offering privacy, and made me think I could finally splash water on myself in the cabin without having to worry about it going all over the floor. Feels private and roomy right now! And with the edges tucked into the tote. I was very happy to put it to actual use later in the day. Kenny said it was fine but awkward. Donna said she needed to get use to it. Donna pointed out that she wasn't thrilled with standing in the dirty wash water of previous occupants. 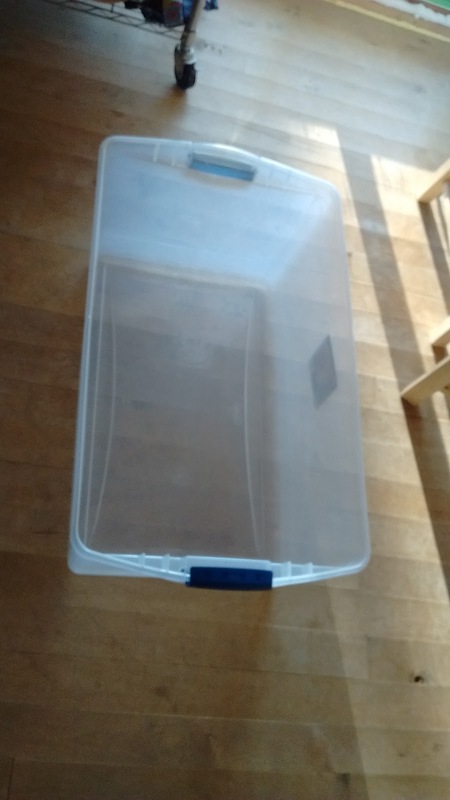 I think I could help with that by putting some sort of "grid" or stand on the bottom so that there was a reservoir under foot. We use very little water in a shower, so it should be fine. I will try to keep posting as I improve this system. So far I remain enthused. The original sump pump shower. Hopefully it will get used in this contraption, but needs to thaw out first. 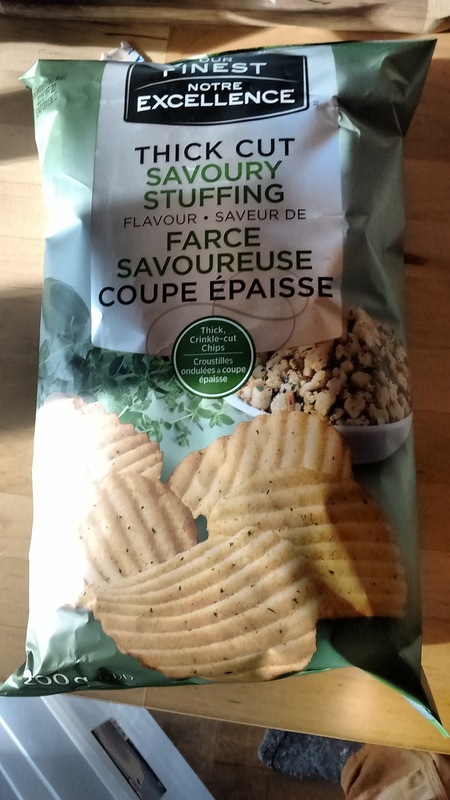 Oh Man, a New Flavour of Potato Chip! 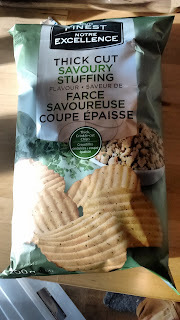 So much better than those disgusting Grilled Cheese Sandwich Lay's Chips. 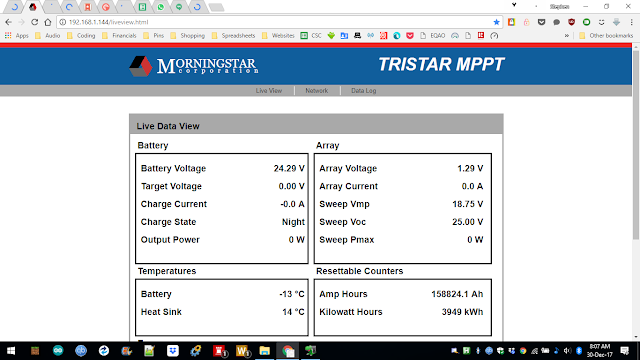 As I discussed a few days ago in my blog entry about heating my solar batteries to prevent power outages, I contemplated using a UPS to provide internet service while the inverter was off due to overvoltage. 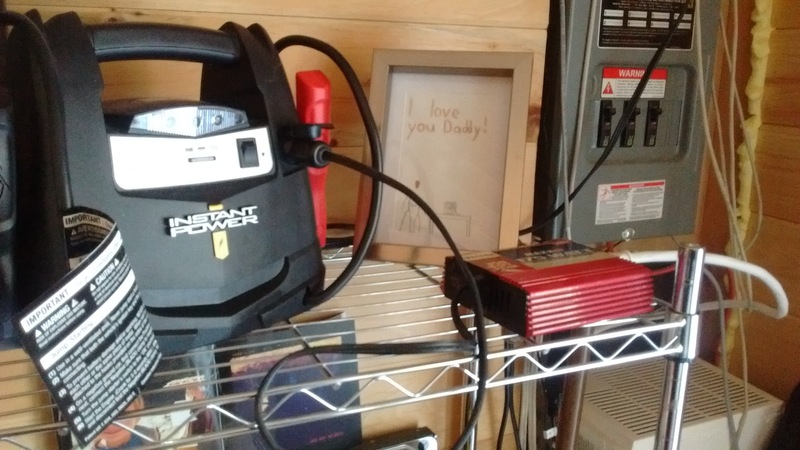 A day or two later, I was at the store after having had to jumpstart the car using the truck, and it dawned on me that a jump starter box could do double duty for me. 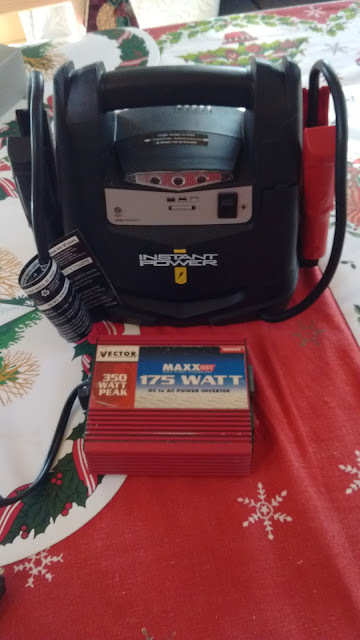 I noted one that included a 12 volt outlet, and I recalled that I had a small, 175 watt inverter that had been only used once or twice in the past decade. I purchased and charged up the power box, and it was some sort of divine intervention that caused the power system to decide to do an equalization cycle just as the power box was indicating a full charge. Matching the old with the new to create something useful! As soon as the power went out, I leapt from my chair and assembled my makeshift UPS (well, in my particular case, it was an *INTERRUPTIBLE* Power Supply). Everything plugged in and ready to hit the power button! I plugged in everything, and amazingly, it worked immediately! It continued to work for just under three hours. Ten minutes later the power came back on as the equalization cycle completed! I know it looks messy, but it works! I'm putting this one in the success column, in spite of it petering out prematurely, and requiring a bit of manual intervention. As I said in my previous post about actually installing the heat pads, I would report back the next morning and let you know how different things were. 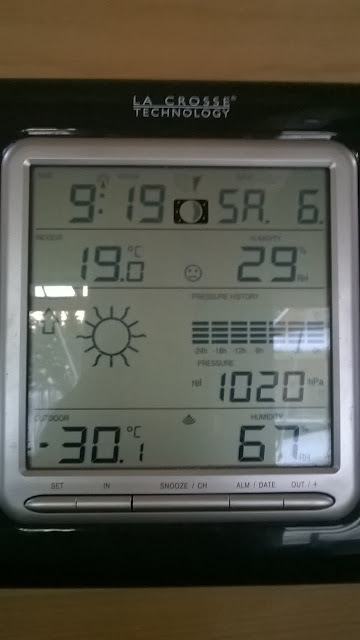 Actually, as I am typing this, the temperature has dropped to -20.0. It's always coldest just as the sun is rising. And the batteries are at -13 degrees. They actually dropped to -14 at the same time as the ambient dropped an extra degree. So there are two interpretations I suppose. We managed to keep the "spread" between the two temperatures to about 6 degrees from last night's eight. That's pretty good I think! Oh wait, it only got about 4 degrees colder ambient, but the batteries dropped 5 or 6 degrees... They got colder faster than the world outside! Take and give off more charge. Not go so high as to cut off all power for the cabin. Aside from this unresolved thread, I can find no further information about anyone trying to warm up their batteries using surplus generator (or solar) power in the winter time to allow them to hold more charge. 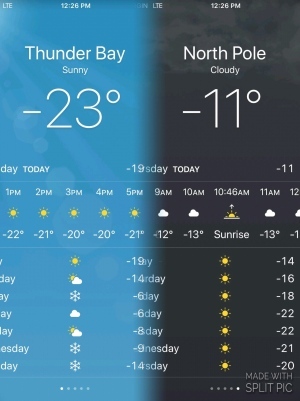 Living in Thunder Bay, we aren't really remotely concerned with shortening our battery life due to overheating issues. It rarely seems to hit 30 degrees, let alone anything approaching a significant threat to battery health. On the other hand, as we've experienced a few times lately, when it is -30 degrees, the batteries have a very narrow range of ability. They charge up extremely quickly, and discharge just as quickly. This is frustrating on multiple levels. At lower temperatures, solar panels actually become more efficient. I can see voltages from my panels of over 120 volts DC at this time of year, still outputting up to 60 amps if the batteries would accept that. Unfortunately, with battery capacity at much less than half of its summer capacity, most of this output goes completely to waste. This is compounded by the fact that at these temperatures, my charger needs to go to voltages in excess of 33.6 volts on my normally 24 volt system. 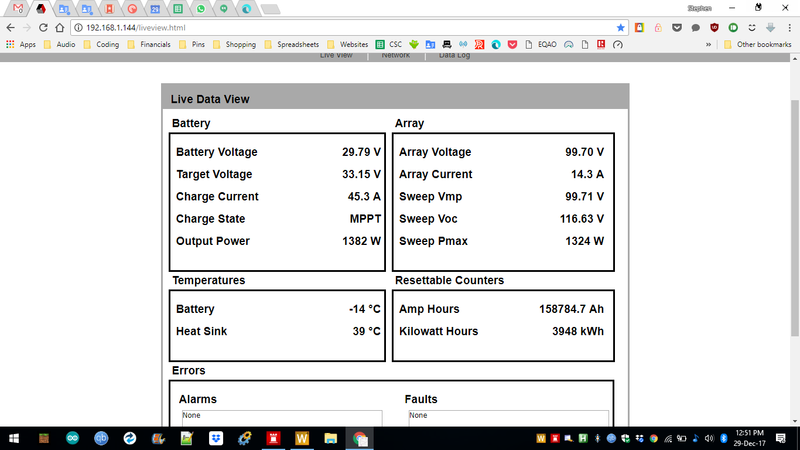 The unintended consequence of this is that my inverter shuts down at 33.6 volts - essentially feeling that there must be a problem with my system and trying to protect itself. So my power goes out because ironically, I am generating too much... power. Two days ago, this gave me an afternoon without power while the batteries fully charged, and then an immediately following morning where the lights went out because the batteries were depleted - and that was with us only running our lightweight stuff - no pumping water or doing laundry or anything high demand. Mulling over solutions, one that came to mind at first was a UPS type of battery backup, at least to keep our internet online while the batteries charged on cold, but sunny days. I may come back to this idea. The other thing I noted was that they were quite close to the 33.6 volt mark, and once they warmed only a degree or two, the power would return. This did indeed happen at the end of the afternoon when the sun finally got to the west side of the cabin where the batteries are housed. This started me thinking about just warming the batteries in general. Then they could accept and give out more charge. Again, I'm not concerned about overheating them. 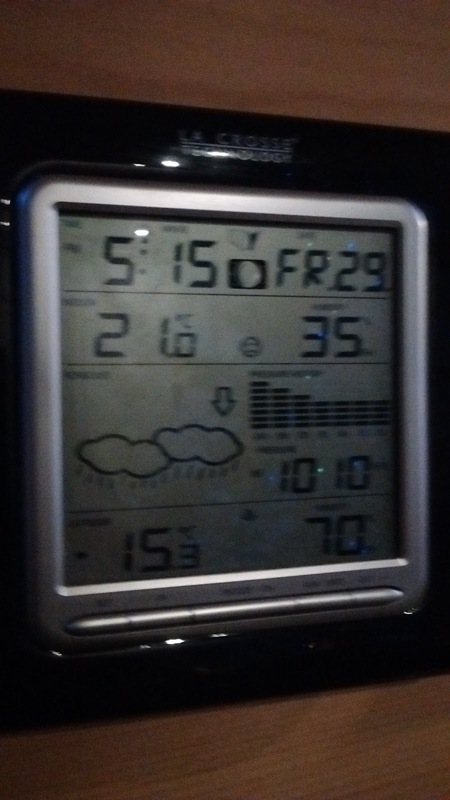 I'd be more than happy to just get them five or ten degrees above ambient temperature and at least have power in the morning until the sun is back up! After some short thought about heating pads as I have seen for vehicles, I took the chance to use a sale in the city to purchase three of the smallest, 50w heating pads. Just laying out the equipment. I managed to find an outdoor extension cord with three outlets and exactly the right length! A closeup on the important details - 50w, 120VAC. I folded them back on themselves (directly against the instructions) and tucked them in the spaces between my batteries. Tucked in between each battery. At these temperatures, outgassing is very minimal, and besides, I put the plugs outside the battery box and below the lip, so there is very little chance of a spark causing any issues. I won't need to use them in the summer anyway. When the sun came out and I had good power, I plugged them all in and observed that they each draw about 2 amps of 26 volt power. That makes perfect sense in terms of them being 50w apiece. Later I powered up the generator to ensure a good charge, and kept them plugged in. As you can see, at the start of the experiment, there was a 2 degree spread between battery temperature and outside temperature. 1pm, -14 degrees in the battery box. Currently there is an 8 degree spread. 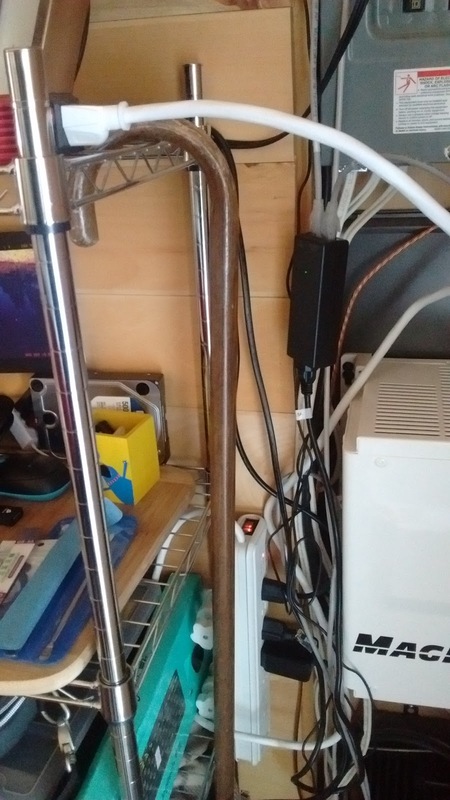 I can't say for certain that some or all of this was due to internal heating due to them charging too, but it seems unlikely that it could cause that much of an improvement. Batteries at - 7 degrees C; so an 8 degree spread with the outside temperature. I will see how that difference lasts through the night, and report back in the morning. 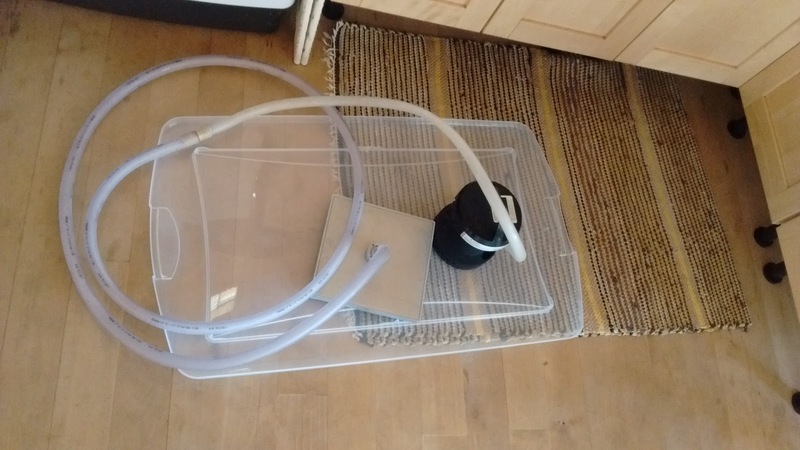 If this seems to work, I will incorporate it into the new and improved battery box I am planning for this summer - perhaps with a thermostat, and maybe trying to get the batteries tighter together and wrapping the heating pads all the way around all four.